Upstart mobile virtual network operator Helio has launched the Samsung Drift, it's first new handset since the company's launch six months ago. 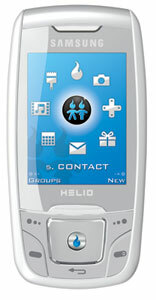 The Drift is Helio's first handset from a manufacturer well known in the USA, the other two were by VK Mobile and Pantech. Helio noted that this is just the first of many upcoming handsets from Samsung. Helio noted that GPS will be a default feature in all future phones, with location based services becoming central to the Helio experience. The Drift ships with a GPS-enabled copy of Google Maps for Mobile. The Drift is now selling for $225. It comes in both white and black (shown below).